Two of Ghana’s finest rappers, M.anifest and Sarkodie met face to face for the first since their famous lyrical war three years ago at the premises of Joy FM this week. The pair got embroiled one of the fiercest music beef of all time in the shape of Kanta and GodMc which got the whole nation talking, including politicians. The assumption is that they still habour resentment towards each other but their meeting at Multimedia, the parent name for Joy FM, Adom FM, Hitz FM etc gave their numerous fans goosebumps because of the act of maturity they both displayed. Apparently, M.anifest had just finished an interview on Hitz FM while Sarkodie was also waiting for an interview on Joy FM. 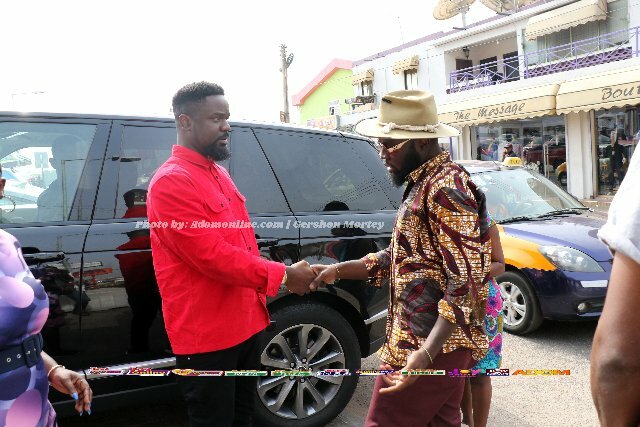 As M.anifest was leaving building, Sarkodie stepped out of his black Range Rover to exchange pleasantries with him. The post Sarkodie & M.anifest Meet Face To Face At The Premises Of Joy FM & What Happened Next Would Give You Goosebumps (+Photos) appeared first on GhGossip.